We have compiled the longest fire history for a region in the Mediterranean Basin, from contemporary fire statistics plus old newspapers and old forest administration dossiers in Valencia (Spain) . With this information we statistically demonstrated that fire regime has changed during the 1970’s, in such a way that fires increased in annual frequency (doubled), fire size, and area burned (by an order of magnitude). The main driver of this shift was the increase in fuel amount and continuity due to rural depopulation (vegetation and fuel build-up after farm abandonment) suggesting that fires were fuel-limited during the pre-1970s period. Climatic conditions were poorly related to pre-1970s fires and strongly related to post-1970s fires, suggesting that fire are currently less fuel limited and more drought-driven than before the 1970s. Thus, the fire regime shift implies also a shift in the main driver for fire activity. In conclusion, the collapse of the rural lifestyle shifted fire regimes from being fuel-limited to be drought-driven, and this may have consequences in an world where droughts are increasing in frequency . The same process occurred in all the European Mediterranean region, and the large fires in Greece during the 2007 heat wave [link] are a good example of a system drought-driven. Interestingly, simultaneously to our study, a similar work has just been published demonstrating that the collapse of the Soviet Union lead to a reduction in grazing pressure and a subsequent increase in area burned . Fig. 1. 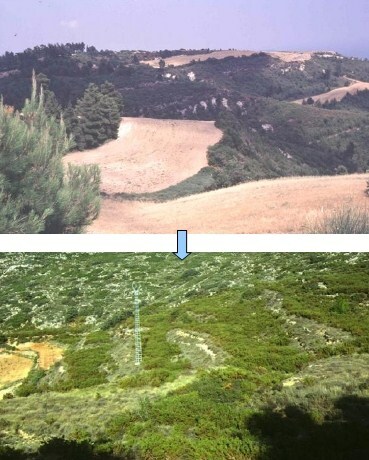 The abandonment of agriculture and livestock, and the change in the domestic energetic sources (from wood to others) modified the landscape from a mosaic (top image) to an homogeneous fuel bed of flammable vegetation (bottom image). These changes drove the increased fire activity since the 70’s (see Fig. 2 below). Fig. 2. 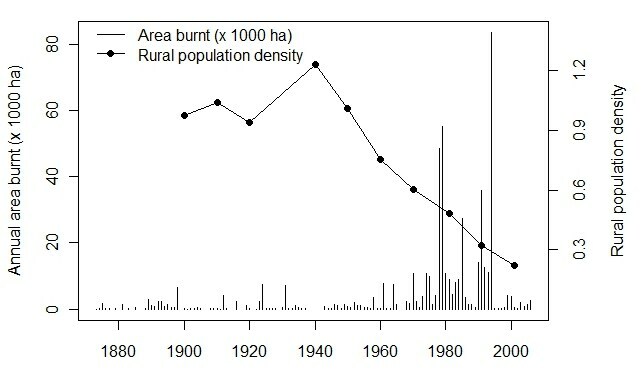 Annual area burnt (ha × 1000, vertical lines, left axis) for 1873 to 2006 and the rural population density (inhabitants/ha, dotted line, right axis), in Valencia (Spain). From Pausas & Fernández-Muñoz (2011).